(Nanowerk News) As words go, evanescent doesn't see enough use. It is an artful term whose beauty belies its true meaning: fleeting or dying out quickly. James Dean was evanescent. The last rays of a sunset are evanescent. All that evanesces, however, is not lost, as a team of Stanford researchers demonstrated in a recent article in Proceedings of the National Academy of Sciences ("Vertical nanopillars for highly localized fluorescence imaging "). In fact, in the right hands, evanescence can have a lasting effect. The Stanford team – led by chemist Bianxiao Cui and engineer Yi Cui (no relation), with scholars Chong Xie and Lindsey Hanson – have created a cellular research platform that uses nanopillars that glow in such a way as to allow biologists, neurologists and other researchers a deeper, more precise look into living cells. 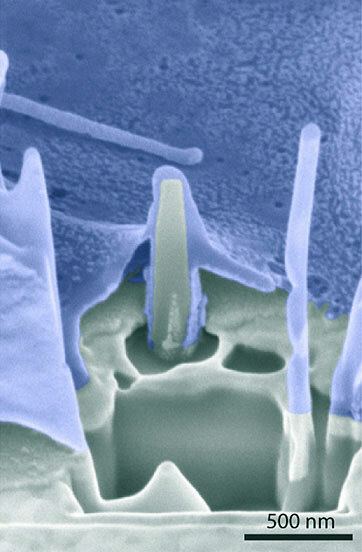 Image of the interface of cell (blue) and nanopillar shows cell membranes wrapped around the pillar. "This novel system of illumination is very precise," said Bianxiao Cui, the study's senior author and assistant professor of chemistry at Stanford. "The nanopillar structures themselves offer many advantages that make this development particularly promising for the study of human cells." Scientists hoping for better, smaller molecular imaging have for years been handcuffed by a physical limitation on how small an area they could focus on – an area known as the observation volume. The minimum observation volume has long been limited to the wavelength of visible light, about 400 nanometers. Individual molecules, even long proteins common in biology and medicine, are much smaller than 400 nanometers. This is where evanescence comes in. The Stanford team has successfully employed quartz nanopillars that glow just enough to provide light to see by, but weak enough to punch below the 400-nanometer barrier. The field of light surrounding the glowing nanopillars – known as the "evanescence wave" – dies out within about 150 nanometers of the pillar. Voilà – a light source smaller than the wavelength of light. The Stanford researchers estimate that they have shrunk the observation volume to one-tenth the size of previous methods. A scanning electron microscope image of a cell grown over and interacting with nanopillars. Arrows indicate three nanopillars. A scanning electron microscope image of a cell grown over and interacting with nanopillars. 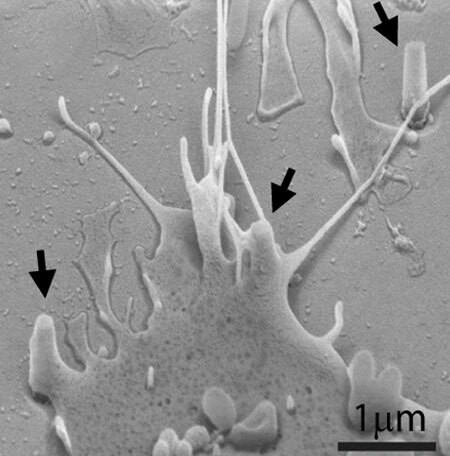 Arrows indicate three nanopillars. The Stanford nanopillar imaging technique is particularly promising in cellular studies for several reasons. First, it is non-invasive – it does not harm the cell that is being observed, a downfall of some earlier technologies. For instance, a living neuron can be cultured on the platform and observed over long periods of time. Second, the nanopillars essentially pin the cells in place. This is promising for the study of neurons in particular, which tend to move over time due to the repeated firing and relaxation necessary for study. Lastly, and perhaps most importantly, the Stanford team found that by modifying the chemistry on the surface of the nanopillars they could attract specific molecules they want to observe. In essence they can handpick molecules to study even within the crowded and complex environment of a human cell. "We know that proteins and their antibodies attract each other," said Bianxiao Cui. "We coat the pillars with antibodies and the proteins we want to look at are drawn right to the light source – like prima donnas to the limelight." To create their nanopillars, the Stanford team members begin with a sheet of quartz, which they spray with fine dots of gold in a scattershot pattern – Jackson Pollock-style. They then etch the quartz using a corrosive gas. The gold dots shield the quartz directly below from the etching process, leaving behind tall, thin pillars of quartz. The researchers can control the height of the nanopillars by adjusting the amount of time the etching gas is in contact with the quartz and the diameter of the nanopillars by varying the size of the gold dots. Once the etching process is complete and the pillars are created, they add a layer of platinum to the flat expanse of quartz at the base of the pillars. The setting is something out of a futuristic John Ford film – Monument Valley rendered in quartz crystal. All that is missing is a stagecoach and John Wayne. In this world, a wide desert of platinum stretches to the horizon, interrupted on occasion by transparent spikes of crystalline quartz that rise several hundred nanometers from the valley floor. The Stanford researchers then shine a light from below their creation. The opaque platinum blocks most of the light, but a small amount travels up through the nanopillars, which glow against the dark field of platinum. "The nanopillars look a bit like tiny light sabers," said Yi Cui, associate professor of materials science and engineering at Stanford, "but they provide just the right amount of light to allow scientists to do some pretty amazing stuff – like looking at individual molecules." The team has created an exceptional platform for culturing and observing human cells. The platinum is biologically inert and the cells grow over and closely adhere to the nanopillars. The glowing spires then meet with fluorescent molecules within the living cell, causing the molecules to glow – providing the researchers just the light they need to peer inside the cells. "So, not only have we found a way to illuminate volumes one-tenth as small as previous methods – letting us look at smaller and smaller structures – but we can also pick and choose which molecules we want to observe," said Yi Cui. "This could prove just the sort of transformative technology that researchers in biology, neurology, medicine and other areas need to take the next leap forward in their research."